While the error of the KJV-only stance is evident to the Biblically astute, it is often helpful to read this translation to get a more vivid flavor of the English translation of God’s Word. So, in reading Paul’s first letter to Timothy, we find the Apostle’s words translated in the vernacular of the king’s English with a particular vigor and poignancy that more modern versions may seem to lack. It’s just that often blunt phraseology that sometimes helps drive home the Scripture’s meaning. Such is the case here. In the ESV, the apostle’s words above seem to somehow lack the same bold levity, though they are no less foreboding in their meaning. But for two Southern Baptist Churches in Texas, it doesn’t matter what translation of Scripture is used. They’re going to disregard what it says anyway. 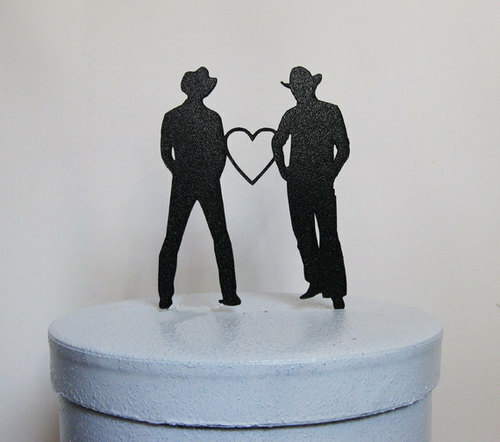 According to two news reports (HERE and HERE) Wilshire Baptist Church of Dallas, Texas and First Baptist Church of Au stin, Texas are facing removal from the Baptist General Convention of Texas for their culturally tolerant, though Scripture-defying, affirming stance on the LGBT issue. Each church publicly affirms their acceptance of openly LGBT members. The Convention issued a statement that clarifies its position in dealing with these two churches. Hopefully, with regards to Wilshire, the State Convention will find the loss of Wilshire’s coins in the coffer to be irrelevant to the need to adhere strictly to the clear teaching of Scripture. Of course, the obvious error in this lofty-toned congregational soul searching is the pesky little truth that the Holy Spirit never disavows what He has previously avowed in His Word. What was sin in the first century has not suddenly become a “good work” in the twenty-first. 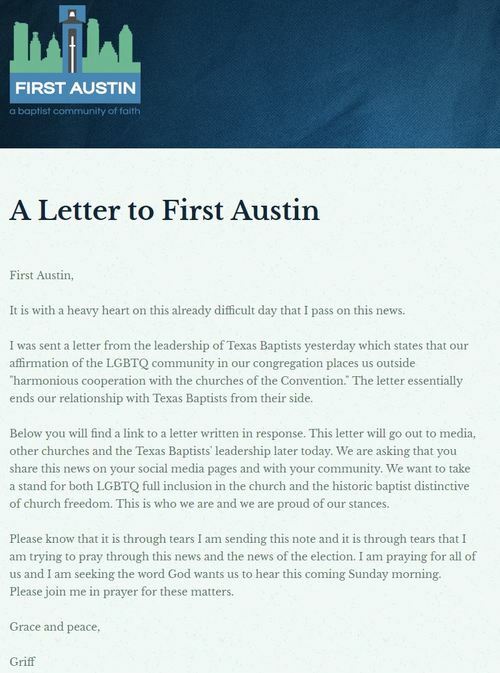 On their website, First Austin’s senior pastor Griff Martin doubled down on his congregation’s willful intent to disregard what Scripture teaches. “We want to take a stand for both LGBTQ full inclusion in the church and the historic Baptist distinctive of church freedom. This is who we are and we are proud of our stances.” Of course, in complete disregard for the words of the Apostle Paul to Timothy to “avoid such people,” (2 Timothy 3:5), this pastor and this church are “proud” of their defiance to Scripture. Perhaps it’s not spurious to suggest that, as with the churches addressed by our Lord in John’s Revelation, they too seemed to exhibit the same “we’ll do what we want the way we want” attitude. But He commanded them to repent or risk the removal of His presence from their midst. “For people will be lovers of self, lovers of money, proud, arrogant, abusive, disobedient to their parents, ungrateful, unholy, heartless, unappeasable, slanderous, without self-control, brutal, not loving good, treacherous, reckless, swollen with conceit, lovers of pleasure rather than lovers of God, having the appearance of godliness, but denying its power.” 2 Timothy 2:2-5. Add to that list of spiraling depravity Paul wrote about to Timothy the evident “giving them up” judgment of God that he describes in Romans, a judgment that is most vividly seen in the removal of His restraining mercy and permitting them to pursue deviant, unnatural sexual passions. The imperative for the authentic believer is clear. To stand with God means to stand in obedience to all things He teaches in His Word. In the United States, where the culture is poised and ready to demand a relaxed, tolerant, modern interpretation of a “living” Constitution – one that changes with the times – the Bible-obedient believer does not have, or need, that luxury with the Holy Writ that directs our faith. The Bible’s truth claims are immutable because its Author is immutable. For a couple of churches in Texas, that claim is clearly one they’ll not be able to make. But they won’t mind … it comes from Scripture … and they clearly have no regard for that. Pray that these churches repent or else face the loss of obedient, true believers who should rightly avoid them. More eternally worrisome for these churches, though, is the loss of His presence. They may have “the appearance of godliness” but, without repentant obedience to the truth of Christ in His Word, they are “denying its power” and thus are not, in fact, faithful churches of our Lord. They are selling a false, damning, “other” gospel that may bring the praise of some men, but is sure to command the eternal wrath of God. Previous story Is Michael Brown Hiding His New Apostolic Identity?